During August 1778, Tiverton was the fulcrum on which the American Revolution teetered. 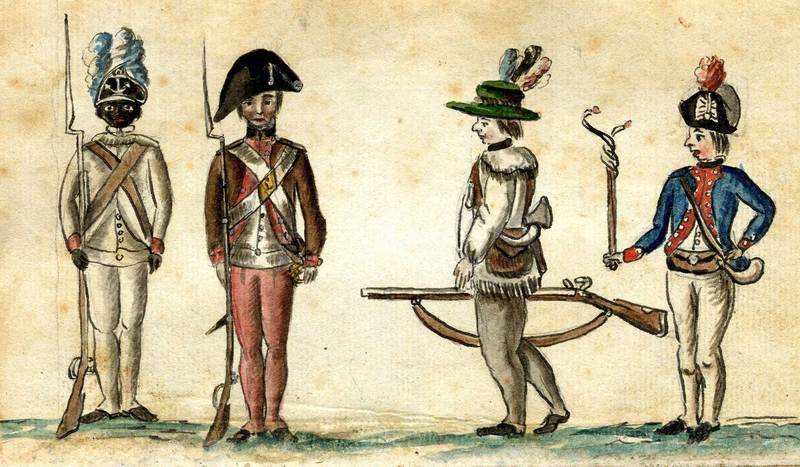 From all over New England militiamen marched along dusty roads to rendezvous at the fort on Tiverton Heights. From Gloucester, Newburyport, and Marblehead came 265 fishermen to ferry American troops across the Sakonnet River. From New York came 1,000 Continental troops led by Rhode Islander Major-General Nathanael Greene, and another 1,000 led by the 19-year-old Marquis d’Lafayette. Perhaps most importantly, from France came a fleet of twelve warships commanded by Comte D’Estaing, gun ports open, brass cannon glinting in the sun, the lead ship flying the French colors. The target of this amassed force was Aquidneck Island, a short row across the Sakonnet. The British occupied the island with a garrison of 6,700 men. Their surrender might break England’s will, resulting in victory for the Americans. D’Estaing knew that the British fleet expected reinforcements to arrive any day, which would mean certain destruction for the French ships. On the morning of August 10, D’Estaing decided to attack the enemy fleet anchored in Newport, but the British commander ordered his ships to flee. They receded toward the horizon with the French fleet after them, preparing to battle in the Atlantic. American commander John Sullivan decided to press the land attack without French naval support. He ferried troops, cannon, horses, and supplies across the Sakonnet River, and the force of 10,000 marched toward Newport. For days, both sides fired cannons at each other mostly without effect, while keeping an anxious eye on the sea, wondering what happened to the naval fleets that had slipped away from Newport to do battle. Whose sails would appear on the horizon? Fog shrouded Newport on the morning of August 20, so thick it was difficult to see fifty yards. When skies cleared after noon, the sails of twelve large ships appeared. They drew nearer until a look through field glasses revealed the French tri-color flying from their masts. But the French fleet had been crippled, not through battle with the British but by a storm at sea, and D’Estaing intended to sail into Boston for repairs. Without support from the French fleet, many militia men wanted no part of British bullets and bayonets, and they began crossing the Sakonnet back to Tiverton in droves. The time had come to end the siege of Newport, but it would not be easy. Sullivan had to ferry nearly 5,000 men across the Sakonnet with an enemy force of 6,000 at his back. The American retreat was defended by the Rhode Island First Regiment, a segregated unit of enslaved Rhode Islanders—African-Americans, Narragansetts, and men of mixed race—who were promised their freedom in exchange for enlisting. The solders of the 1st wore uniforms of cream-colored pants and jackets, with tall white hats emblazoned with blue anchors and topped with big blue feathers. Twice the Hessians charged with their bayonets. Twice, in deadly hand-to-hand fighting, the 1st Rhode Island drove them back. The Hessians took on reinforcements and again attacked. With the help of reinforcements, the 1st “soon put the Enemy to rout,” Nathaneal Greene reported to General Washington, and the American forces escaped to Tiverton. The Battle of Rhode Island resulted in a military draw. The Americans lost 30 dead and 137 wounded, while British losses were 38 dead, 210 wounded. The enemy temporarily kept their stranglehold on Rhode Island, but the underdog Americans stood toe-to-toe with the mighty British and had driven them back. 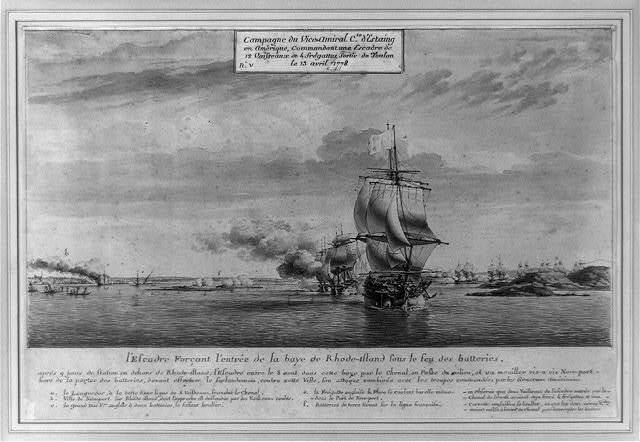 "Entry of the French squadron in Newport Bay Aug. 8, 1778": This print, made from a drawing done by French artist Pierre Ozanne in 1778, depicts the entry of the French fleet under the Comte D'Estaing into Newport harbor shortly before the "Battle of Rhode Island." 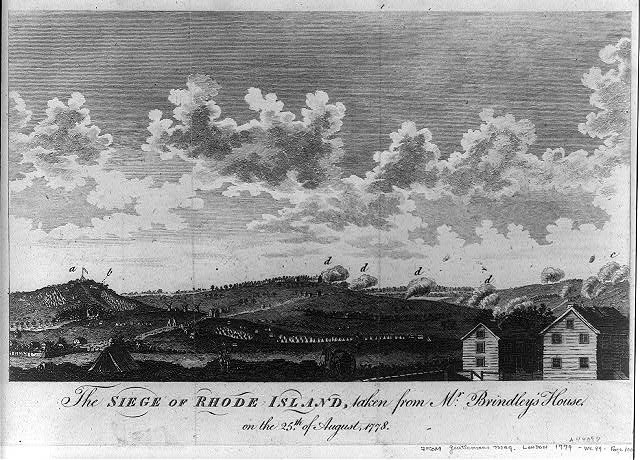 "The siege of Rhode Island, taken from Mr. Brindley's house on the 25th of August, 1778" : This period print provides one perspective on the "Battle of Rhode Island" that occurred in August of 1778 as American troops attempted, and failed, to cross over from Tiverton and successfully retake Aquidneck Island. 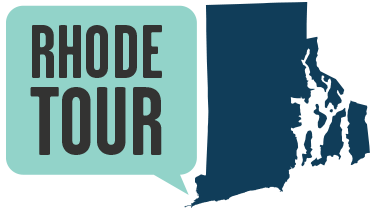 Gerald Carbone, “The Battle of Rhode Island,” Rhode Tour, accessed April 21, 2019, http://rhodetour.org/items/show/91.